Brief Introduction to Current Transformer and Its Applications. 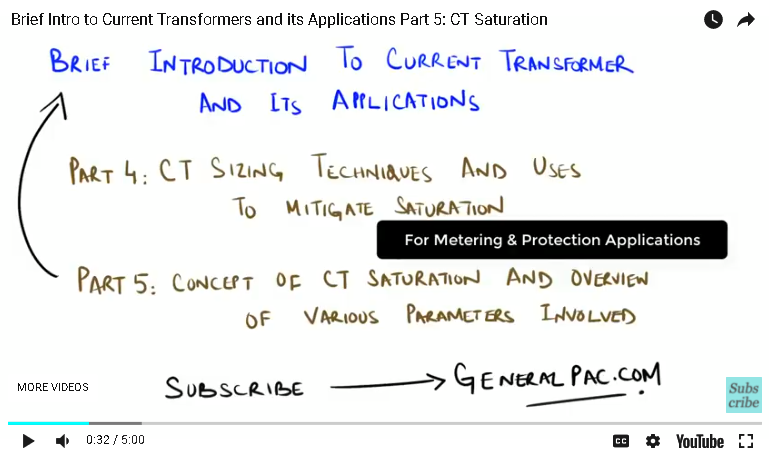 In part 4, we talked about the techniques involved in sizing a current Transformer for protection and metering applications, and how it can be used to mitigate saturation. 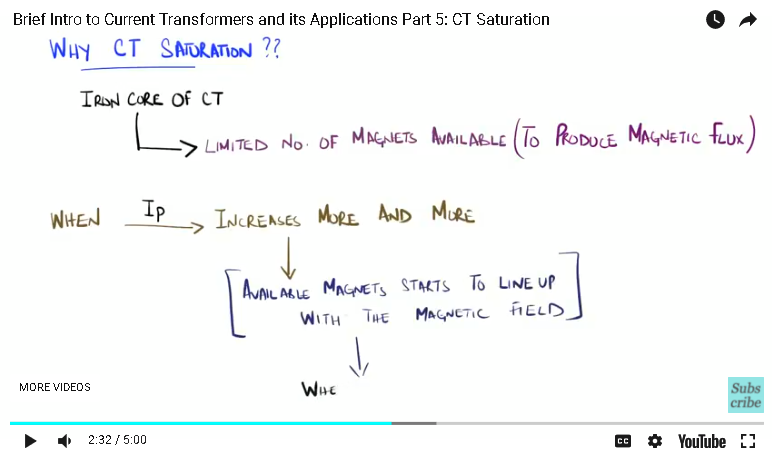 In part 5, we will build upon the previous discussion and talk about the concept of CT saturation, including a brief overview of the various parameters involved. Let us start by first establishing the basic concept of saturation. We shall now revisit the equivalent circuit from the previous parts. As we start increasing the primary current “Ip”, which flows through the primary winding, it generates a magnetic flux in the transformer core. Assuming that the secondary terminal is connected to a load, or a burden, this magnetic flux induces a secondary voltage “V s,” … The secondary current “I s,” begins to flow in the secondary circuit. This secondary current “I s”, induces its own flux in the secondary winding, which acts in the opposite direction to the flux present in the primary winding. These two fluxes try to cancel each other out, and this process continues until the CT reaches “saturation”. To put it in more simple terms, the CT can no longer produce magnetic flux to account for the increase in the primary current “Ip”. 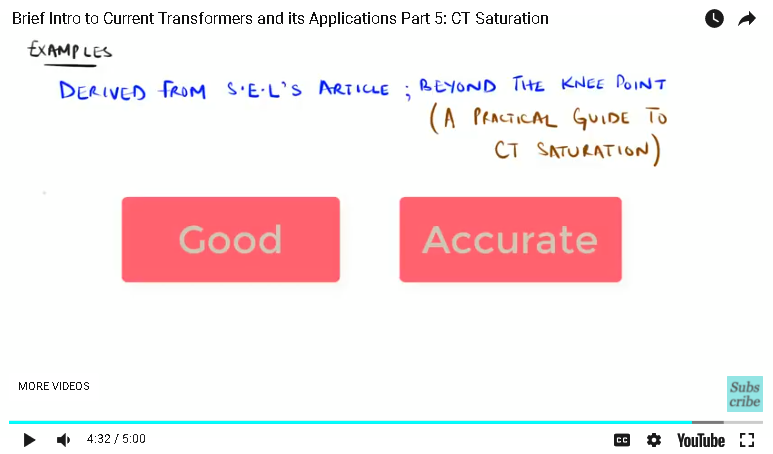 A reference to the content can be found in the article “Beyond the Knee-point: A practical guide to CT Saturation” by “Schweitzer Engineering Laboratories”. Coming back to the discussion, the reason why this happens, is because within the iron core of the current transformer, there are limited number of magnets available to produce the desired magnetic flux. As the primary current increases, more and more of the available magnets start to line up with the magnetic field. And once all of them have been lined up, “that” is the point at which the CT becomes saturated. 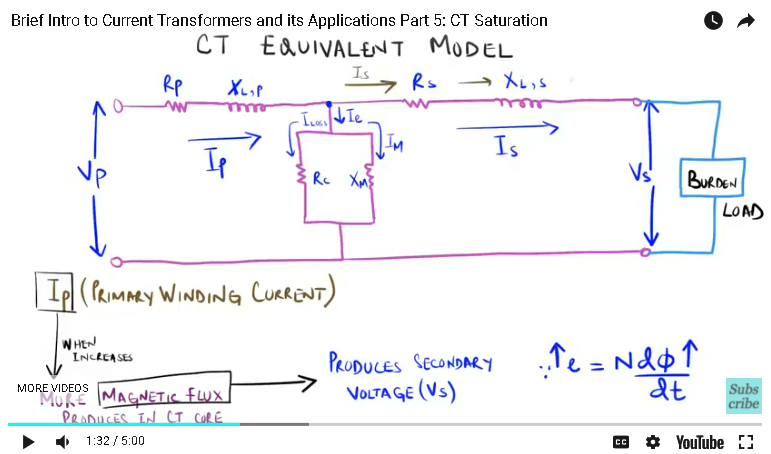 The resulting issue comes from the fact that the CT can no longer accurately transform the primary current. In order to understand more about the effects of CT saturations, let us draw a typical excitation graph. On the x-axis, we have the excitation current “I e”, and on the y-axis we have the secondary terminal voltage “V s”. 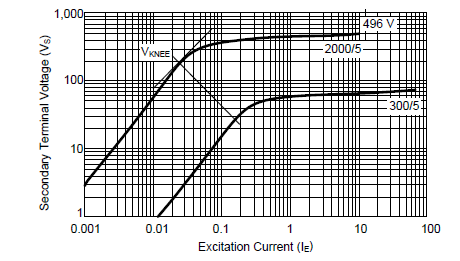 An important parameter to consider is the “knee-point voltage”. We can define this as the voltage beyond which a 10 percent increase in the “secondary voltage”, will cause the “excitation current” to increase by 50 percent. We can recall from our discussion in previous parts, the greater the excitation current, the lower the accuracy of the output secondary current. We want the excitation current to be as low as possible, and it is exactly why the normal CT operating point should remain below the “knee-point voltage”. 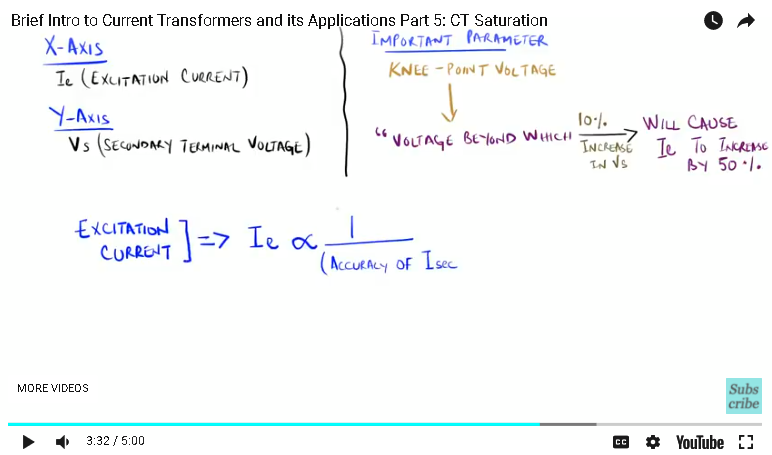 Keep in mind that the “point of saturation” is not the same as the knee-point voltage. The point of saturation does occur after exceeding the knee-point voltage, however, it is defined as the point where the CT error, starts to exceed the 10 percent accuracy limit. In conclusion, knowledge of CT saturation is critical for power systems protection. Other parameters and mitigation techniques will be discussed in more detail in a dedicated topic for CT saturation. In part 6, we shall talk about the importance of understanding the concept of CT polarity. We hope, you have a continued interest in this topic and series as a student or professional. We also hope you find this content useful and enlightening. Please consider subscribing to GeneralPac.com… Making Power Systems Intuitive.